Oh crikey, I'm not even sure if I like eggnog. You see, in England, we hardly ever have it. To be entirely honest with you, until I started writing this post, I didn't really know what it was. Okay, I knew it had egg in it, perhaps a splash of cognac too, but that was about it. Even thought it might have had something to do with Advocaat, which in a sense, it has, as they're made from similar ingredients. There's an interesting article on the history of eggnog on the net. It originated in England, apparently, and then became popular in the United States, especially at Christmas. I found a recipe for a Mexican version of eggnog in Elisabeth Lambert Ortiz's excellent little book, The Festive Food of Mexico: Ponche de Leche y Emas y Cognac. Her recipe will make 4.5 litres of the stuff. Beat 15 egg yolks with 450g caster sugar in a large bowl until light and lemon coloured. Whisk in 2 litres of milk. Pour the mixture into the top of a double boiler set over hot water and cook. Stir at a very low heat until the mixture is thick enough to coat a spoon. Remove from the heat and stir in a tablespoon of grated orange peel. Whisk in a bottle of cognac (or other brandy). Serve in tots or small punch cups topped with a little grated cinammon, and one or two wafer thin strips of orange peel for decoration. If you're in the mood, you can also put a cinnamon stick into each cup. I picked up a taste for the Margarita Cocktail when I was in California. I would argue that it is one of the three greatest cocktails of all time alongside the Dry Martini, and the Bloody Mary. There are various theories as to when and how the Margarita was first born. Carlos "Danny" Herrera is said to have first mixed a concoction of white tequila, lemon juice, and Triple Sec in 1938. He was the barman at the Rancho La Gloria in Tijuana, the Mexican border town where the Caesar Salad had been invented by Caesar Cardini. Essentially, the Margarita is a mix of Tequila (Silver or Blanco tequilas are preferable to the gold), Triple Sec (ie Cointreau), and Lime Juice (or possibly Lemon Juice). 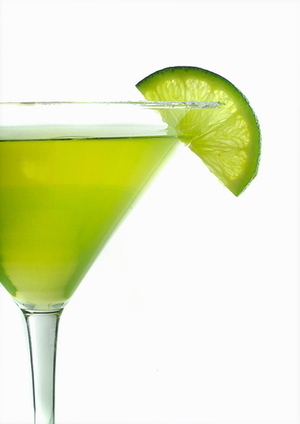 The rim of the glass is moistened with lime juice, and then dipped into salt. Some Margarita afficinados claim that salt was only used to hide the taste of a low-budget tequila, but I have to put up my hand and say that I like the contrast between the salt and the sweetness of the tequila and the Triple Sec. I trawled the net for authentic Margarita recipes and found this one from "Drink of the Month" in the December 1953 issue of Esquire Magazine: 1 ounce tequila Dash of Triple Sec Juice of 1/2 lime or lemon Pour over crushed ice, stir. Rub the rim of a stem glass with rind of lemon or lime, spin in salt—pour, and sip. Again, simplicity rules ok? Nothing frozen. No cocktail umbrellas. No extra ingredients. A Margarita is a Margarita. Got it? The 1st and 2nd of November are celebrated in Mexico as the Festival of the Day of the Dead. It does, of course, co-incide with our Hallowe'en, but the emphasis is on joy and celebration, rather than the macabre. The Mexicans believe that death is not the end, but instead the beginning of a new stage of life, and celebrate the lives of former loved ones with colourful parades, papier-mache skeletons, bright pink sugar skulls and anarchic carnival. I haven't been yet, but one day I would love to fly over there and join in the fun. Well, it had to be a Mexican recipe today, didn't it? As it's The Greasy Spoon, I've adapted a Mexican version of Prawn Cocktail, although I think it originally came from Peru. 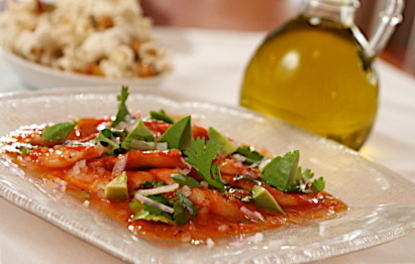 It's called Ceviche. The raw prawns are "cooked" in lime juice. It's delicious. For my American readers, we say "prawn", you say "shrimp". So let's call the whole thing off. In a mixing bowl combine fresh prawns, lime juice, salt and pepper. Your prawns will need to be extremely fresh. Mix it all together. Cover and stick in the 'fridge for twelve hours. The acid in the lime juice will "cook" the protein in the fish. You will know when the mixture is ready, when the prawns have turned pink. In case you were wondering, they start off a grey colour in their natural state. Now it's time to add the other ingredients. In the meantime, you've cut up red peppers, red onions, plum tomatoes, and yellow peppers into julienne (which is a cheffy term for thin strips). Add these to the bowl. Next add a finely chopped jalapeno chili, a teaspoon of sugar, and a dash of wine vinegar. 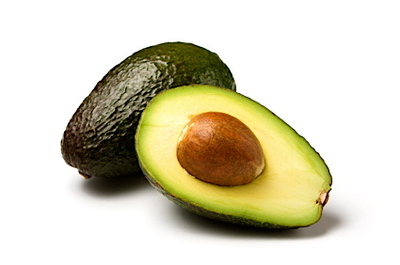 Finish the whole thing off, by garnishing with a thinly sliced or diced avocado, and roughly chopped coriander. You could get away with serving this as a first course in a wine glass, though in the photograph above, it's presented on a serving plate. Very retro, and slightly different. I like it. When I'm in Manhatten, nothing's better than hailing a cab and heading straight for P. J. Clarke's at 55th and 3rd, where you can order a bowl of chili with saltine crackers. I've been hesitant to write about chili, because I know how seriously Americans take it, and that battle reigns between the Texas Red version (meat-rich and without beans), and other recipes from other States. Some have tomatoes; others don't. Some have black beans, some kidney beans, and the Texan cowboy version quite definitely doesn't. 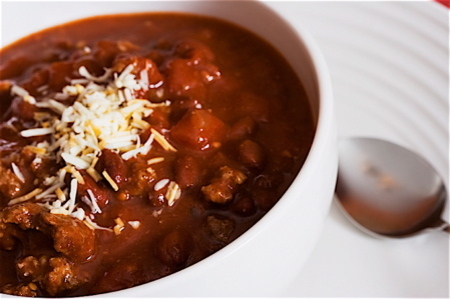 In Britain, chili con carne is often nothing more than stewed mince with kidney beans plus a pinch of chili powder. Here's my idea for a richer more authentic venison chili. Saute some chopped onions, garlic and chopped red chilis in some oil and butter. Stir in chili powder, oregano, cumin, and paprika. Now add the venison. You can either chop the meat into chunks, or put it through a mincer (if you've got one). Cook for a bit until the meat is sealed and coloured. Now add some stock, beer (the Mexican beer, Corona, is excellent), and a splash of Tabasco. Let the chili simmer at a low heat, until the meat is cooked. You want the sauce to be reasonably thick. When the meat is nearly done, add some tomato puree, or even better, sun-dried tomato paste, and grate in some bitter dark chocolate- the sort of quality chocolate (high in cocoa solids) you can buy in delis and specialist shops. Season with salt and black pepper to taste. Finally, stir in some cooked beans (Kidney, Haricot, or Black Beans are fine, it doesn't really matter). Serve with grated cheese on top, sour cream, and saltine crackers.